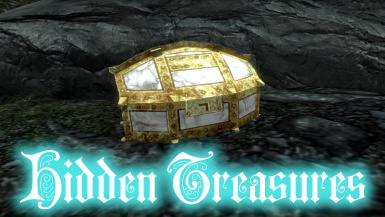 200 hidden lootable chests with a unique design for you to discover all around Skyrim. Adds many secret treasure chests around the game for you to find and loot. They have been well hidden so you will need to actually seek them out to discover them, or if you are already a thorough looter you should stumble across some of them. The treasure is all levelled including gold (in testing I was finding 250 - 900 at lv.30), gems, jewelry, soul gems, and other valuable that fit in small containers. There are no weapons or armour as they would be too big. I highly doubt you will find them all, but it will be nice bonus for your character every now and then when you do. There are 200 scattered around Tamriel, in towns and villages, in dungeons, houses, taverns, shrines, and he rest. I'll give you a hint - if you reach somewhere that looks significant there's a good chance there is one nearby, but obscured from direct view. The locations have been well thought out and sneaky, they are all reachable within reason, NOT just plonked in the middle of nowhere or buried in the sea, but you WILL walk right past lots of them even when you are within a few feet! This mod places new obects in many cells, so the only possible conflicts would be any mods that edit the areas I placed my hidden treasure. Regardless it won't cause CTDs. This mod uses vanilla levelled lists to determine the loot so other mods that alter loot levelled lists will benefit from using this mod.